Last week, I shared my Fall dining room with you. Today, I’m going to give you a tour of my kitchen dressed for Fall. This is a lengthy post so you may want to grab a cup of coffee or tea. I hope that you enjoy the tour. At one end of kitchen, there is built in shelving. This is where I chose to display some of my blue and white collection. For the Fall season, I placed small orange pumpkins, fall berries, sunflowers, and pine cones throughout my blue and white collection. On the pantry door, I placed a Fall wreath. Below is one of my kitchen counters. I love roosters, and you will find them throughout my kitchen. They are the perfect French Country accessory. Above the kitchen cabinets, you will find more roosters perched on French hat boxes. You will also find cows in my kitchen. Below my Hereford painting, I placed some fall berries for that extra autumnal touch. This is a simple Fall vignette I created for my kitchen island. I placed a tiered tray on a white platter. I filled the tray with bittersweet, pumpkins, and gourds. I also placed blue and white teacups and pretty linen napkins on the platter. This is the view facing the breakfast area. The fall centerpiece on the kitchen table consists of a dough bowl filled with greenery, pumpkins, and gourds. This table belonged to my grandmother. When I received the table, as a newlywed, it had several coats of paint on it. I decided to paint it black and add gold accents to it. On the French Pastry Table, I placed a pumpkin and Fall berries on a jadeite cake stand. Thank you so much for joining me for my French Country Kitchen Fall Tour. Next week, I will be giving you a tour of my living room. On a side note, this week, Tablescape Thursday will take place on Wednesday. 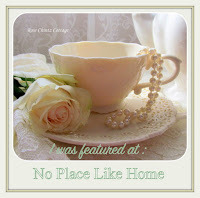 I have been asked to participate in a Fall Tablescape Blog Hop hosted by Chloe at Celebrate and Decorate. Thirty bloggers, six a day, will be presenting their Fall tablescape creations. I have included a schedule below. Be sure to visit these talented bloggers. There will be lots of beautiful Fall inspiration. I hope that you have a happy and blessed Monday!!! Your fall kitchen tour is just beautiful! Thank you, Eilis! I hope that you have a wonderful and blessed week!!! Thank you, Summer! I hope that you have a wonderful day!!! So pretty, Shannon. I love your cabinet with all of the blue and white china, and the flowers…the perfect touch! Thank you so much! I hope that you have a wonderful day!!! Looks like you are ready to welcome Fall in a big way. such a pretty and welcoming kitchen. I really need to get on the ball with my Fall decor! Thank you, Chloe! I hope that you are having a wonderful day!!! Shannon, I love your charming French Country kitchen! The blue and white collection looks fabulous with the pops of orange from the pumpkins. Thank you for sharing with us and have a lovely day. Thank you for the sweet comments, Sandi! I’m so happy that you stopped by for the tour! I hope that you have a wonderful day and a blessed week!!! Thank you, Pam! Your tablescape this morning was so beautiful, and it looked like it belonged in a magazine! I’m so excited to be participating with such a talented group of ladies!!! Love your colors and how everything looks so warm and inviting! Thank you so much, Karen! I’m so happy that you stopped by for the tour, and I hope that you have a wonderful evening!!! Your kitchen looks so pretty. I like how you have the blue in contrast to the orange pumpkins and other fall items. Thank you so much, Debra! I’m so happy that you stopped by for the tour, and I hope that you have a wonderful day! Thank you, Karren! I’m so happy that you stopped by! I’ll be sure and stop by for a visit Wednesday! I hope that you have a wonderful and blessed day!!! I would love to know where you got your kitchen wood chairs. I love everything you did in the kitchen. This is the first time I have visited your blog…love it. Linda, I am so happy that you found my blog, and that you stopped by for the kitchen tour! Thank you so much for your very sweet and kind comments. The chairs belonged to my mother-in-law. She gave them to me when she bought a new breakfast table. I know that they are by Ethan Allen. I do not know if they still make them though. I hope this helps. Again, thanks for your very gracious comments, and I hope that you have a wonderful afternoon!!! Hi Sarah! Thank you for your very sweet comments! I’m so happy that you stopped by for the tour! Happy Fall, and I hope that you have a wonderful rest of your week!!! Thank you, Stacey, for the sweet comment! I’m so happy that you stopped by, and I hope that you have a wonderful weekend!!! Everything looks great! Love the blue and white dishes and the fall colors. Lovely French Country kitchen! Hi Liz! Thank you so much for your very sweet comments! I’m so happy that you stopped by, and I hope that you have a wonderful and blessed week!!! This is the first time I have visited! What a beautiful autumn kitchen you have! Hi Lynne! I am so happy that you stopped by for the tour! Thank you so much for your sweet comment! I hope that you have a wonderful week!!! Shannon, I love blue and white, but add in a touch of orange and I’m really swooning. Everything looks so fresh and welcoming. I’d love to spend time in your kitchen. Thanks for the tour. Happy Autumn! Sarah, you are welcome in my kitchen any time! Thank you so much for the kind compliment! I hope that you have a wonderful and blessed week!!! Your kitchen is so beautiful. I love every little pumpkin placement. I wanted to buy that lamp! LOVE IT. Thank you, Debbie! I love that lamp, and feel so fortunate to have it. I don’t know if you know the story behind it, but it belonged to the late Mr. Charles Faudree as well as the pastry table it sits upon. It was a birthday gift from my husband. I’m so happy that you stopped by for the tour, and I hope that you have a wonderful and blessed day!!! You have a very pretty kitchen! Thanks for sharing at Home Sweet Home! Thank you so much, Sherry! I’m so happy that you stopped by for the tour! Thanks for hosting Home Sweet Home! I hope that you have a wonderful day! Happy Fall!!! You have a lovely kitchen and your fall decor is gorgeous. Thank you for sharing at Dishing it and Digging it link party. It’s great having you. Thank you for your sweet comment, Vanessa! I hope that you are having a wonderful week! Happy Fall!!! Love your fall kitchen with all the bleu! Thank you, Judith! I’m so happy that you stopped by for the tour! I hope that you are having a wonderful weekend! Happy Fall!! !